Wollongong-born Rhys played junior rugby with Illawarra Wests before beginning his senior career with the Rabbitohs, making his debut aged 18 in 2004, before moving on to the Tigers in 2008. Rhys had made 21 NRL appearances before linking up with the Crusaders in 2010 where he was joint top try scorer in his first season. 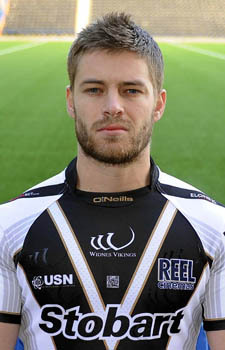 After his move to Widnes Rhys became one of the Vikings most consistent performers and was the dominant force as the Vikings found their Super League feet late in 2012, using pace and agility to set up and score tries as well as scoring the first goals of his senior career. 2013 saw Rhys move successfully to Fullback, make his 100th career appearance and gain selection for the ‘Exiles’.